This August, cool off by the water, cocktail in hand. Though summer has been pretty tame so far in Belgrade, that doesn’t mean we’re not in for a scorching August. Thankfully, there are plenty of places where you can cool off, cocktail in hand. If you’re spending the summer in the city and looking for a place to take a dip, here are a few places you might want to check out. Many Serbs consider Bela Stena the best sandy beach on the Danube, not just in Belgrade. A river island on the right side of the Danube close to Pancevo, Bela Stena is a trek from the city centre but close enough for a day-trip. It’s also pretty easy to get to. Just go to the port in the Belgrade suburb of Visnjica and take a boat direct. The ride costs less than a euro and takes just 10 minutes. But given its beauty, be prepared for a crowd. On a hot summer’s day, it’s almost impossible to get a spot in the shade. Many visitors fire up the barbecue. But if you want to sit in a restaurant and enjoy some food and drink there are a couple of taverns to choose from. 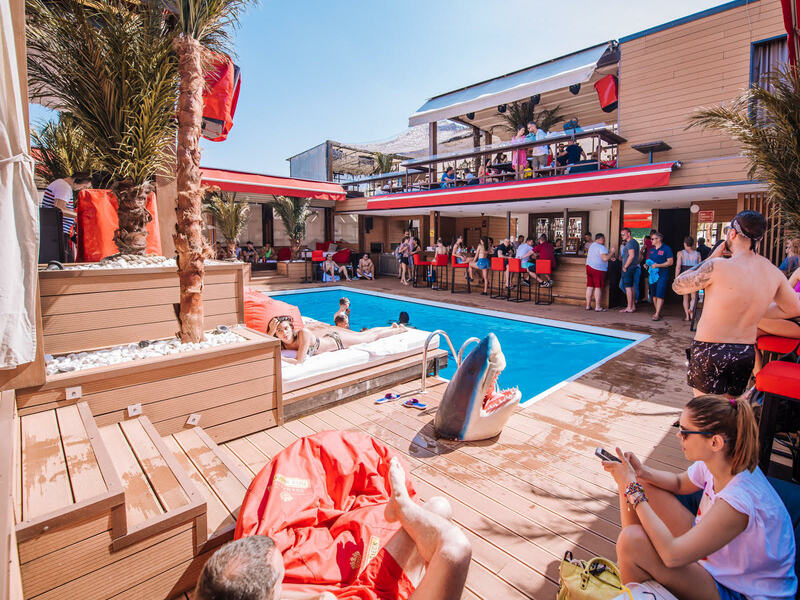 Think plastic chairs and Coca Cola umbrellas, with a menu to match – cheap beer, wine, sodas and the traditional Serbian fare of fish stew and beans. If you’re looking for a beach that offers a real escape, Bela Stena is the best Belgrade has to offer. Known as the “Belgrade Sea,” Ada Ciganlija is a popular artificial lake a few kilometres from the city centre. There’s a ton of stuff to do there, from golf to paintball, biking to basketball and, of course, there are the bars. The best extend their seating all the way down to the water, and have no problem with the clientele taking a dip in the water and returning to their tables. It’s even encouraged. The bars and cafes are many and varied. For the more upscale, try Koketa and Petica on the Makiska side where you can enjoy a cocktail. There’s also, inevitably, the riverside edition of Smokvica, the slightly posh cafe chain that can be found across Belgrade. Both are great places to chill during the day and fun to visit at night, but there’s no swimming allowed once the sun sets and the lifeguards hang up their Speedos. Reziser (Director) and Na Kraju Sveta (At the End of the World) are other good places to relax, offering reggae or jazz rather than house music. Na Kraju Sveta is particularly chilled-out. It’s pet-friendly, offers great freshly-squeezed juices and is conveniently close to Ada’s nudist beach, if that floats your boat. All in all, it’s safe to say that a trip to Ada Ciganlija is unavoidable if you plan on spending the summer in Belgrade.